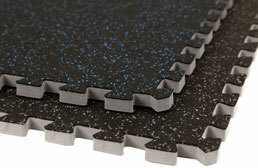 We carry two different thicknesses of rubber topped tiles at FoamTiles.com. Our 3/4” thickness is available in both black/blue and black/grey while our 3/8” thickness is available in black/grey. Both rubber tiles feature a recycled rubber top that has been bonded to a closed cell EVA backing. This provides you with a floor that is both durable and comfortable. These interlocking tiles are mold and mildew resistant and are very easy to install. Two detachable edge pieces are provided, allowing you to create border, corner and center tiles. 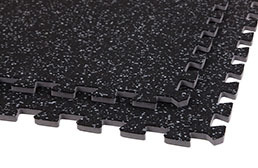 Slip resistant and sound absorbing, these rubber foam tiles are great for both residential and commercial applications. These shock absorbing foam tiles have been used as flooring for home gyms, in basements, as trade show flooring, offices and much more.